So far there are 13 confirmed Democrat 'IneptOcrat' candidates for the 2020 presidential election, with three others having formed exploratory committees, with others, such as former VP Joe Biden maybe being a possible, probable candidates, all of them running on platforms that seemingly conform to the policies of one of the newest members of the House of Representatives, the one that is a self-declared socialist, Alexandria Ocasio-Cortez. One of the newer names running as an "ineptOcrat" is Andrew Yang who thinks running on a platform that includes handing $1,000 to every American adult, which would cost the U.S. approximately $4 trillion a year, is a practical idea. We have Kamala Harris, Cory Booker, Bernie Sanders, Elizabeth Warren and others have all touted "medicare for all." Elizabeth Warren even ventured into the "pay reparations" to African Americans because of slavery that ended over a century ago, well until polling showed that the majority of Americans don't like that idea, now she doesn't want to discuss the issue. Kamala Harris and Julian Castro also waded into that reparations minefield. Almost all the IneptOcrat candidates have signed on to support the "Green New Deal," which in it's initial roll-out, where the FAQ page for it was plastered on Ocasio-Cortez's website (before it was promptly removed after people saw the ridiculous things within), included things like eliminating "farting cows," and airplane travel. Of course she later claimed that a "draft," had been uploaded accidentally, yet that doesn't address the fact that they actually had a draft that included eliminating cow farts and plane travel. Those are just the tip of the iceberg as to how far towards socialism the 'IneptOcrats' are leaning these days. The term "IneptOcrats" was brought to my attention by Twitchy, and it fits so well, I decided to use it, with a hat tip to Twitter user Mo Mo, who provided a longer list of positions one or more of the presidential contenders, and party leadership are pushing for. She then followed that up with the following statement "Basically, more direct democracy followed by punitive, top down government fiat by bloated ineptocrats. Seems like a winner." She had a lot more to say, so click over to Twitchy and read through her thread, she makes excellent points. While knowing their platforms is important to be an informed voter, those platforms aren't even the worst of the problems that liberal ineptness are causing them. Why are the 2020 liberals lurching so far towards socialism right now, rather than the gradual gravitation that has marked the previous decades? 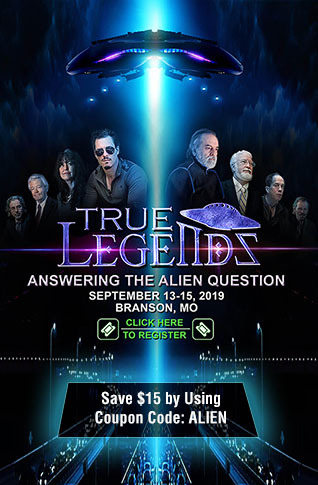 Because they are attempting to ride the coattails of the popular kid on the block, Congress-Kid Alexandria Ocasio-Cortez. Some most likely just want to ride the wave of popularity while hoping it lasts, while others most likely are weary of her highlighting them and then releasing her online mob of activists against them if they take more moderate positions. She has already been quoted as threatening more moderate democrats if they don't toe the line, telling them they were going to be on a "list," to be revealed to her online cult followers, as well as threatening to help "primary," them to get them out of Congress. 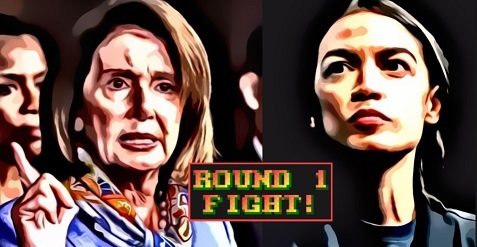 When college kids were surveyed as to who the "face" of the Democrat party is, rather than choosing Speaker of the House, Nancy Pelosi, who is the most powerful IneptOcrat in congress, the overwhelming response was Ocasio-Cortez. Tom Perez, the DNC chair, has referred to Ocasio-Cortez as the "future of the party." So, presidential contenders decided to ride the wave of a young freshman congressKid, who in a short few months has made so many flubs and gaffes that there are already compilation videos published, and they did so without thinking about what happens when they start pushing her policies, then Americans start realizing how radical and inept Ocasio-Cortez truly is. Well, the numbers are in and the more Americans learn of the little socialist darling, the more UNpopular she has become. 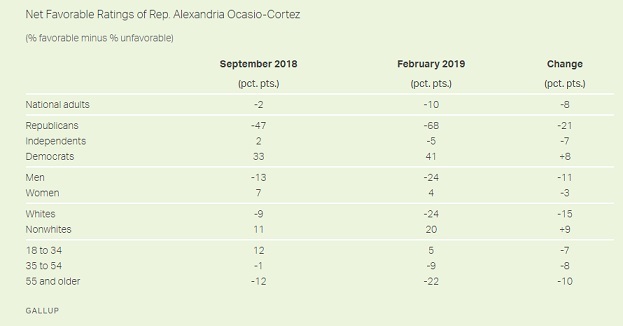 Gallup reports that "Ocasio-Cortez is better known, but image skews negative." In September 2018, as she was running for her congressional seat, 24 percent viewed her favorably, 26 percent unfavorably and a whopping 50 percent had never heard of her or had no opinion. By the end of February 2019, 31 percent viewed her favorably, 41 unfavorably with only 29 percent lists as never heard of or no opinion. The breakdown is truly telling, as only two demographics gave her a net favorability after learning more about her and her socialist position, non-whites and Democrats. she is up by 8 points among democrats and 9 points among non-whites. In September she had a net -2 favorable rating with national adults, and by February, just six months later, she has a net -10 favorable rating. She lost 21 points among Republicans, lost 7 points among independents, lost 11 points among men, lost 3 points among women, lost 15 points among whites and lost in every voting age demographic. She lost 7 points among 18 -34 year olds, lost 8 percentage points from voters between 35 to 54, and lost 10 points among voters 55 and older. All these IneptOcrat presidential contenders have spent months hitching their car to her train and now they are all going to fly off the cliff with her. Note To Reader Battlesheep: MEME AWAY!!! 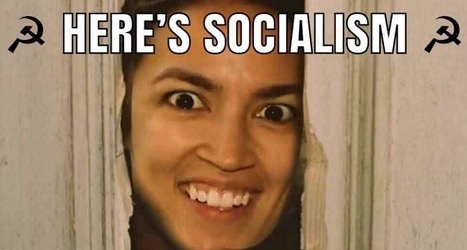 U.S. citizens that fled to America to escape brutal socialist regimes and the policies, are now expressing concern about where their "fellow" democrats are heading, as they take to op-ed pages and try to warn the party as a whole that they haven't a clue what they doing. Giancarlo Sopo, Cuban American, writes over at USA Today "Democratic socialism is a lot like the system my family fled, except its proponents promise to be nicer when seizing your business." Chinese-Americans "see ghost of communism in Democrats’ leftward turn": "Damn socialism, why are you chasing me?" 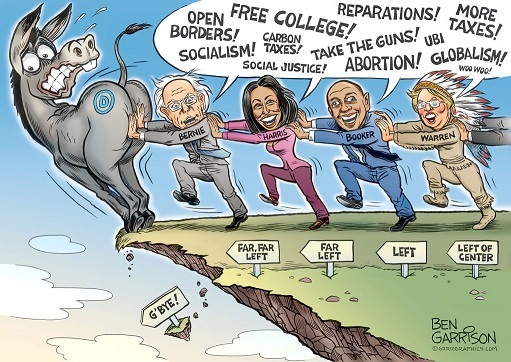 What better word comes to mind than "inept" when we watch a parade of democrat candidates all hanging on a young freshman socialist's coattails, who is becoming ever more unpopular, as they continue to pitch their radical socialist policies as their platforms? Those who fled, or had families flee socialist regimes and the dictators and tyrants that run them, are screaming from the rooftops, issuing dire warnings, yet the "ineptOcrats" continue to march right along, dragging moderates right off the cliff with them. Below you will see "Venezuelans Send Message To Americans Who Want Socialism."